Recently a photo of an alleged NVIDIA RTX TITAN surfaced on the web. The photo was from Gavin Free, one of the creators of The Slow Mo Guys on YouTube. Also, from the latest episode of the WAN Show, Linus “accidentally” showed or teased the retail box of the NVIDIA RTX TITAN. 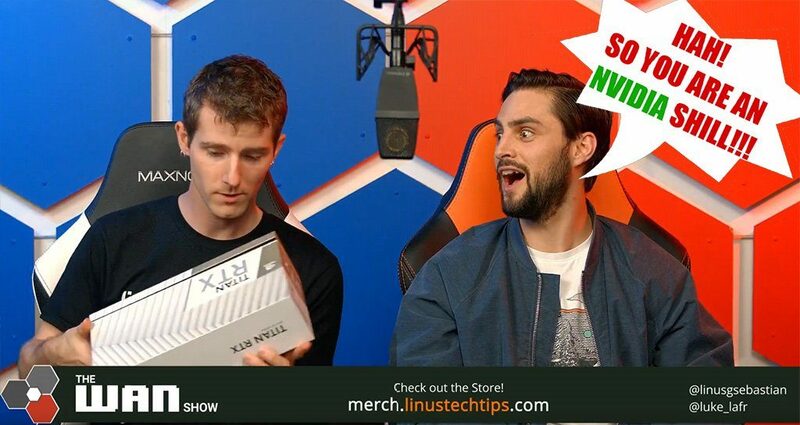 Knowing how strict Linus is, especially when it comes to unannounced products, I’m pretty sure it was intentional and wasn’t accidental at all. Also, Gavin Free is not your usual source of leaks; NVIDIA would have informed him that he can’t show it on his Instagram and Twitter if it was a product under a specific embargo. Check out the photos below. NVIDIA RTX TITAN Graphics Card – Leaked or Teased? I can’t really say it was “leaked”, and I more convinced that they were teased (intentionally). The NVIDIA RTX TITAN may be based on a full TU102 GPU Core, unlike the NVIDIA GeForce RTX 2080 Ti Founders Edition that has some of its SMs disabled. RTX TITAN has a total of 72 SM and 4608 CUDA Cores similar to the Quadro RTX 8000 / RTX 6000. It may also features 576 Tensor Cores, 72 RT Cores and up to 10 GigaRays/sec of raytracing performance. Details are unconfirmed at this point and all are just speculations. However, if there’s one thing we are more or less sure of, the NVIDIA RTX TITAN’s specs and configuration may be similar to an RTX Quadro less the amount of VRAM, but definitely better than the RTX 2080 Ti. In terms of price and release date, expect that the NVIDIA RTX TITAN will be one very expensive graphics card. The RTX 2080 Ti is already a very expensive graphics card, currently priced north of $1,000 USD. The RTX TITAN might be price near $2,000 or more. After all, TITAN’s are geared towards pro-consumers and are not really aimed towards the mainstream gamers. NVIDIA may announce the new RTX TITAN this month, or perhaps at CES in January 2019.